Masanobu Fukuoka, the Japanese farmer/philosopher from Shikoku Island, and author of The One-Straw Revolution, passed away on August 16, 2008 at the age of 95. He continued to farm and give lectures until just a few years before his death. He had been in poor health since October 2007, and in August of 2008 he asked his doctor to discontinue treatment. He passed away peacefully at his home a week later during the O-bon festival. O-bon, after New Years, is the most important Japanese holiday. It is when the ancestors come back to earth for three days to visit the living. It is a happy time. Villagers tend to the graves, families relax, visit and reminisce as children play together in the summer sun. On the evening of the third night the ancestors go back with a sendoff of songs and fireworks. Fukuoka-sensei died on the third day of O-bon. 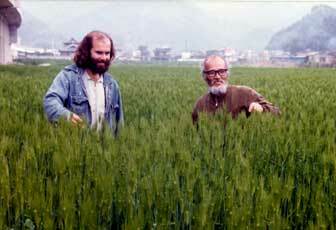 Masanobu Fukuoka was born on the Japanese island of Shikoku on 2 February 1913. Iyo, his birthplace, is a small town on the west coast, sixteen miles from the city of Matsuyama. His family had been settled there for hundreds of years. On Iyo's hillsides overlooking Matsuyama, his father, Kameichi Fukuoka, cultivated mandarin oranges (tangerines). These orchards, combined with extensive rice lands below, made Kameichi the largest landowner in the area. Kameichi was an educated man, having completed eight years of schooling, which was exceptional for his day. Repeatedly the local leaders selected him mayor. Fukuoka’s mother, Sachie Isshiki, was of Samurai descent and also well-educated. She was gentle, whereas his father was strict and permitted no luxuries in the household. Even so, Fukuoka remembers a childhood of ease. Tenants tilled the family rice lands. As the second child of six and eldest son, his only chore was to gather wood after school each day. The family was Buddhist but was tolerant toward Christianity, which had penetrated the Iyo region long before; as a boy Fukuoka was accustomed to seeing Christian symbols incorporated into household Shinto shrines. Years later, he would send two of his daughters to missionary schools. Fukuoka’s own education began in Iyo's local elementary school, but for middle and high school he had to travel to Matsuyama. Thus, for many years he rode his bicycle daily to Iyo Station, took the train to the city, and went the rest of the way on foot — about half an hour's walk. He claims to have been an inferior student who infuriated his teachers. (One day, in a rage over his misbehavior, the music teacher slammed down the top of the village's only organ so hard that it broke.) Although lessons did not interest him, the boy was impressed by the advice of his literature teacher who urged each student to make five fast friends during his lifetime so that there would be five people to weep for him when he died. As it was expected that Fukuoka would inherit the family farm, his father sent him for higher education to Gifu Agricultural College, near Nagoya, on the main island of Honshu. Gifu was a three-year state college where students learned modern techniques for largescale farming. Once again, Fukuoka was an indifferent student who preferred to spend his time horseback riding and "fooling around"; student life was generally idyllic and irresponsible. However, a feeling of impending crisis swept the school in 1932 when Japan annexed Manchuria. Fukuoka and his fellow students detested the intensified military training they were now obliged to undergo. At Gifu, Fukuoka specialized in plant pathology under the eminent Professor Makoto Hiura. He found good company among the students who gathered in Hiura's office to help with the professor's research and to chat. As jobs were scarce when Fukuoka graduated in 1933, Hiura persuaded him to continue his research at Okayama Prefecture Agricultural Experiment Station. The following year Hiura found him a position in the Yokohama Customs Office, where he was assigned to the Plant Inspection Section. In its laboratory perched on top of a hill overlooking the city's port, Fukuoka studied diseases, fungi, and pests found on imported fruits and plants, spending his time, as he later recalled, "in amazement at the world of nature revealed through the eyepiece of the microscope." Every three days he took his turn inspecting incoming plants directly. During his time off, he enjoyed the life of the town and "fell in and out of love" several times. In his third year at Yokohama, however, he was struck down by acute pneumonia, or incipient tuberculosis. Hospitalized, he was subjected to wintry-cold air as part of his treatment. His friends avoided him, fearing contagion. Even the nurses fled after taking his temperature because the room was so cold. Sick and lonely, Fukuoka feared for his life. He was twenty-five. When he finally recovered and returned to work, Fukuoka remained distracted by his harrowing brush with death and he began brooding obsessively about life and what it was meant to be. One night during a long solitary walk on the hill overlooking Yokohama he approached the edge of a cliff. Looking down, he wondered what would happen if he fell from the cliff and died. Surely his mother would cry for him, but who else? Overcome by realization of his failure to acquire five true friends, he collapsed into a deep sleep at the foot of an elm tree. He awoke at dawn to the cry of a heron. He watched the sun break through the morning mist. Birds sang. At this moment Fukuoka had a revelation: "In this world there is nothing at all." There was no reason to worry about life. As he wrote later, he suddenly understood that "all the concepts to which he had been clinging were empty fabrications. All his agonies disappeared like dreams and illusions, a something one might call 'true nature' stood revealed." Fukuoka embarked immediately upon a new life. The next day quit his job and set off gaily on an aimless journey. He wandered the sea, to Tokyo, to Osaka, Kobe, and Kyoto, and finally to the southern island of Kyushu. For months — he himself doesn't know how many — he lived on his severance pay and the generosity of others he jubilantly broadcast his newfound belief that "everything is meaningless." But people dismissed him as an eccentric and he fine went home and retreated to a simple hut on the mountainside. He entrusted with his father's richly-bearing citrus grove, he beg putting his revelation to a practical test — by doing nothing! Convinced that everything should be allowed to take its natural course, Fukuoka left the meticulously pruned fruit trees to nature. He then watched as insects attacked, branches interlocked, and orchard began withering away. His father's decimated grove provided Fukuoka his first important lesson in natural farming: you cannot change agricultural techniques abruptly — trees that have been cultivated cannot adapt to neglect. In 1939, Japan's deepening involvement in military expansion abroad interrupted Fukuoka’s rustic existence. Besides the fact his parents' concern over his odd behavior, it was no longer considered appropriate for the son of the mayor to be "hiding" in the hills. About the same time, he was offered the post of chief of the Disease and Insect Control Section of the Kochi Prefecture Agricultural Experiment Station. Acceding to his father's wishes, he accepted. He moved to remote Kochi, on the other side of Shikoku Island, a remained there for the next five years. At Kochi, Fukuoka and his colleagues were expected to increase wartime food production, especially through advances in scientific agriculture. While concentrating on research, Fukuoka also advised farmers about chemical farming and wrote a "farming tips" column for a local newspaper. On his own, however, he conducted comparative studies. He compared yields from intensively cultivated crops enhanced with compost and chemical fertilizers and pesticides those achieved from crops grown without chemical additives. His conclusion was that the use of fertilizers and pesticides was not really necessary. Although these additives resulted in a marginally higher yield, the value of the yield did not exceed the cost of achieving. Thus, at Kochi Fukuoka established to his satisfaction the superiority of natural farming over farming with chemical aids. Building upon his earlier revelation that "doing nothing was best," these studies laid the scientific basis for his lifework. During holidays from the research station, Fukuoka visited his family in Iyo. On one of these visits in the winter of 1940, a local matchmaker introduced him to six young women, one of whom, Ayako Higuchi, pleased him and agreed to be his wife. They were married in the spring. The first of their five children, daughter Masumi, was born the following year, to be followed in due course by a son, Masato, and three more daughters, Mizue, Mariko, and Misora. At Kochi, far from home and the battlefields, Fukuoka philosophically pondered the problems of war and peace. At one point, he drafted his ideas in a letter to the president of the United States. He cannot remember whether he mailed it. Later, in Mu: The God Revolution, he compared the conflict among animals in nature with war among humans and concluded that only man's conflicts are fought with love and hate, and it is these conflicts that are truly savage. In the tradition of Zen Buddhism, he believes that love and hate are two sides of the same coin, both are qualities of man alone, and both are but clouds of illusion. He concludes that in the final analysis, man's so-called love is merely love of self. Fukuoka was finally conscripted in the last desperate months of the war. His duty, from May until August 1945, was helping build mountain redoubts to prepare for the defense of his island homeland. He did his best to become a good soldier, he says, but looking back realizes that in the military "you lose all the faculty of thought and become like a worm. That is the most horrible part of the war." The war's sudden end "exalted him." He and his fellow soldiers "scraped the Emperor's chrysanthemum seal from their weapons," cast their guns away, and went home. The first months of the Allied Occupation of Japan were traumatic. Local officials like Fukuoka’s father were purged from public office, and in October General Douglas MacArthur, head of the occupying forces, proclaimed land reform. Fukuoka’s father, in a fit of remorse over his past life as a prosperous landlord, gave up more land than was required, which left the family with only three-eighths of an acre of rice land. But because land reform applied only to rice lands, the citrus orchards in the hills were still theirs. Here, Fukuoka once more took up his pursuit of a way of farming fully integrated with nature. What he had learned from his earlier farming experience was that no area, once cultivated, was natural. Orchards were quite unnatural. And trees accustomed to pruning would not fruit well with the sudden withdrawal of pruning care. From this, Fukuoka realized that to grow food by "doing nothing" would require a framework of effort. His task? To create a food-producing environment that diverged as little possible from what he considered a natural one. To learn how to accomplish this, Fukuoka says, "I just emptied my mind and tried to absorb what I could from nature." For the next few years, therefore, he observed which plants and animals lived naturally on his small piece of earth. He scattered fruit, vegetable and tree seeds randomly and watched as some of them rooted a thrived while others died. (Cypress, cedar, and orange trees grow best in the rich soil of his orchard; cherries, peaches, pears, and plums in the thinner soil.) Proceeding by trial and error, he farmed the land passively. Instead of asking, "how about doing this?" asked, "how about not doing this?" Over the years, his original insight about natural farming was borne out. As a more natural ecology was re-established, the less he did, the better the land respond This is why his Four Principles of Natural Farming, as he eventually summarized his experience, compose a list of things not to do. » The earth cultivates itself, observed Fukuoka. There is no need for man to do what roots, worms, and micro-organisms do better. Furthermore, plowing the soil alters the natural environment and promotes the growth of weeds. Therefore, his first principle is: No plowing or turning of the soil. » Secondly, in an unaltered natural environment the orderly growth and decay of plant and animal life fertilizes the soil without any help from man. Fertility depletion occurs only when the original growth is eliminated in favor of soil-exhausting food crops or grasses to feed cattle. Adding chemical fertilizers helps the growing crop but not the soil, which continues to deteriorate. Even compost and chicken dung cannot improve on nature, he concluded; moreover, chicken dung can cause the disease rice blast. Therefore Fukuoka's second principle is: No chemical fertilizers or prepared compost. Instead he promotes cover crops like clover and alfalfa which natural fertilizers. » Weed is everywhere the enemy of the farmer. Yet Fukuoka observed that when he ceased plowing, his weed population declined sharply. This occurred because plowing actually stirs deep-lying weed seeds and gives them a chance to sprout. Tillage therefore not the answer to weeds. Nor are chemical herbicides, which disrupt nature's balance and leave poisons in the earth and water. There is a simpler way. To begin with, weeds need not be wholly eliminated; they can be successfully suppressed by spreading straw over freshly sown ground and by planting ground cover. Eliminating intervals between one crop and another through carefully timed seeding is essential. No weeding by tillage or herbicides is Fukuoka’s third principle. » Finally, what to do about pests and blights? As Fukuoka’s grain fields and orchards came more and more to resemble a natural ecology — with the proliferation of plant varieties growing all ajumble — they also created a nature-like habitat for small animals. In such a habitat, Fukuoka noted that nature's own balancing act prevented any one species from gaining the upper hand: snakes eat the frogs which eat the bugs, and so on. Furthermore, insect infestations and diseases attack the weakest plants, leaving the strong to fruit more abundantly. (A blight-reduced rice field, he says, may actually yield larger quantities of grain than one left untouched.) Although chemical solutions can be effective against pests and plant diseases in the short run, in the long run they are hazardous. Wholly aside from the pollution they leave behind, they permit weak, chemical-dependent plants to survive. Left to itself, nature prefers hardier stock. Fukuoka’s fourth principle is: No dependence on chemical pesticides. Thus Fukuoka evolved his techniques for natural farming by the process of elimination. Along the way he also abandoned the water-filled paddy field and stopped planting seeds beneath the ground in tidy rows. He stopped chopping up straw and laying it neatly upon the fields as most Japanese farmers were wont to do. Straw worked best, he found, if it is scattered whole upon the ground. In these ways, Fukuoka abandoned the artful tidiness of traditional Japanese farms and the regimentation of modern ones, in favor of the unkempt exuberance of natural growth. Fukuoka’s "direct-seeding, non-cultivation, winter grain/rice succession" illustrates the application of his principles to grain growing and shows his natural farming to be both simple and complex. In the fall, as his rice plants reach maturity, Fukuoka scatters seeds among the browning stalks: winter grain (rye, barley, or wheat), white clover, and rice. (Seeding amidst the rice makes it harder for birds to get at the new seed.) After the rice is harvested in October v covers the field with its straw. This protects the seeds and inhibits weeds. Clover and the winter grain soon grow through the mulch; the rice lies dormant until spring. In the months that follow, the grain stalks rise above the clover; the grain matures in May. Fukuoka cuts it, spreading it on the field to dry, and then threshes, winnows, and sacks the grain, re-covering his fields with the stalks. Now briefly he introduces water into the field. This loosens the clover and weeds and permits the rice seeds to sprout. After he drains off the water the clover recovers and grows heartily beneath the rice plants. Once again in August, Fukuoka briefly floods the field. In October, before the rice is harvested and threshed — all with tradition Japanese tools — the cycle begins again. It should be noted that Fukuoka is building upon and refining Japanese agricultural practices that are centuries old: planting alternating crops of rice and winter grain each year without depleting the soil. The major differences are, in traditional farming, rice seedlings are transplanted from starter beds, the rice is grown in standing water and the fields are weeded. Straw, for the traditional farmer, as for Fukuoka, has always been an essential mulch. As a compost straw enriches the earth, and as a ground cover it inhibits weeds, fosters germination, frustrates birds, and retards water evaporation. A difficulty with Fukuoka’s non-plowing, direct-seeding method planting is that exposed seeds become prey to birds and animals. By casting the seeds amidst a standing crop and covering them with straw, the birds can be kept at bay, but moles, crickets, slugs, and mice present another problem. For many years Fukuoka thwarted foraging insects and rodents by pelletizing his seeds, that is, by encasing them in clay. Pelletizing seeds also keeps them from rotting if the season is unusually wet. However, by keeping a natural balance in the animal kingdom Fukuoka now seldom needs to coat his seeds, thus eliminating another task. Fukuoka has been refining his grain-growing method for over thirty years. Despite the skepticism of agricultural experts his untidy, naturally watered (forty to sixty inches annually) grain fields achieve yields equivalent to and sometimes surpassing those of intensive cultivated and irrigated fields that are treated with the latest commercial inputs. At the same time, as he likes to point out, his soil becomes richer and richer. His orchards have also thrived under this regime of attentive inattention. As he learned very early, simply abandoning already cultivated fruit trees to grow on their own had disastrous results. It was necessary first to restore a natural environment to the hillside, in which fruit trees could flourish with minimum pruning and, in keeping with his four principles, without tilling, weeding, or applying fertilizers or pesticides. As with his grain fields, years of trial and error passed before Fukuoka could grow mandarin oranges and other fruits by "doing nothing." Beginning immediately after the war with 1.75 (later expanded to 10) acres of his father's aging and depleted citrus trees, Fukuoka addressed two fundamental problems. First was how to restore and enhance soil fertility without using fertilizers. Second was how to restore the heavily pruned trees to their natural form so that eventually, he hoped, they would require no pruning. To restore fertility Fukuoka proceeded on the premise that ground cover — green manure — might best rehabilitate the clay soil. He experimented by scattering on the ground the seeds of thirty grasses, crucifers (e.g., turnips, cabbages, radish), and legumes (peas, soybeans), studying their growth carefully. In time, he adopted ladine clover as his primary hillside ground cover. Ladine clover suppresses weeds, improves the soil, and does not compete with the fruit trees for moisture or nutrition; moreover, it is hardy and need be sown only once in six or eight years. He found alfalfa, lupine, and bur clover useful as secondary cover. The more he departed from monoculture, the more fertile the soil became. He planted myrtle and acacia trees whose roots penetrated to a deeper stratum of the soil, loosening it and adding nutrients such as phosphoric acid, potash, and nitrogen. And he interplanted the trees with shrubs and climbing fruit vines. Although mandarin oranges dominated, eventually some thirty varieties of fruit trees grew amidst the botanic profusion of his three-dimensional (vegetables, shrubs, trees) orchard. Meanwhile, the hard red clay soil, he says, "became loose, dark-colored, and rich with earthworms." As regards pruning, Fukuoka learned that once a fruit tree has been pruned, it must be pruned forever after. Consequently he experimented with a new type of pruning designed to mold trees back to their natural shape. Discovering what was the natural shape of an orange or cherry tree was not easy; what was commonly presumed to be natural was really the shape of the pruned tree after it had been abandoned. Because virtually all fruit trees have been cultivated by man and their seeds bear the results of cross-breeding, Fukuoka concluded that "no one has ever really seen a totally natural fruit tree." To discover the natural shape of fruit trees, therefore, Fukuoka studied other kinds of trees that still grew wild in the forest. For instance, forest-grown pines and cedars have straight trunks; the branches are spaced so that they do not cross and so maximum sunlight reaches all the leaves. Under ideal conditions, he insists "no matter how small the plant or large the tree, every leaf, every shoot and branch grows out from the stalk or trunk in an order and regular arrangement." Eventually Fukuoka was able to establish "with considerable certainty" the optimal natural forms for many trees in his orchard including several varieties of orange as well as persimmon, chestnut, pear, apple, and loquat. He then sought, by careful and discreet pruning, to induce his trees to conform to the model. Fukuoka’s interventions in the growth of his fruit trees differ radically from those of conventional orchardists. Whereas the lab seek to shape the tree to facilitate fruiting and efficient cultivation and harvesting, he seeks to shape trees in accordance with what conceives to be nature's original design. He maintains that the more his trees are encouraged in a natural shape and provided with greater growing space, the less pruning they require. Increasingly he says, he can take it easy and "let the orchard grow itself." Vegetables growing semiwild are an important part of this three-layered orchard ecosystem. Fukuoka’s planting technique is to broadcast the seeds and let the plants grow randomly among the clover, weeds, and trees. Here, too, an intimate awareness of natural patterns is necessary. By trial, error, and keen observation Fukuoka has learned how to introduce vegetables into the ecosystem at the right time and in the right way. To sow winter vegetables, for example he waits until the wild summer grasses are drying. Then, after a good rain, he cuts back the grasses, scatters the vegetable seeds, and covers them with the freshly cut grass. The seeds germinate safely beneath the mulch and gain a head start on the winter weeds. The latter Fukuoka cuts back a few times until the new vegetables can compete on their own. Similarly, summer vegetables are planted just as the winter weeds are losing their vigor. Chickens and birds will eat some of the seeds but many will survive to germinate. Already in his early years at the Kochi Prefecture Agricultural Experiment Station Fukuoka realized that he, and the other scientists and Japan's highly bureaucratized food authorities whom he views with scorn and often criticizes, were heading in almost diametrically opposite directions. By the 1970s highly commercialized scientific farming had transformed the Japanese countryside. Farmers no longer produced food for their own families and for local markets but found themselves enveloped in the complex web of modern agribusiness. Prompted first by the need to feed Japan's growing population, and later by the demands of affluent urbanites, they scurried to keep up with the latest high-yielding varieties of grain, fruits, and vegetables, and with the fertilizers and pesticides to grow them. Eventually farmers also learned to use dyes, waxes, and preservatives to bring "perfect" fruits and vegetables to market. The number of persons engaged in farming declined dramatically and farms came to resemble mini-factories. Meanwhile, state-sponsored agricultural scientists provided ever newer seeds and chemicals to keep farmers just ahead of the latest plagues, blights, and consumer trends. In the midst of this huge transformation, Fukuoka’s farm and orchard seemed primitive and irrelevant. This was all the more true because, although he occasionally reported some of his findings in agricultural journals and forums, he had little contact with anyone outside his village. He devoted himself instead to what he later called "the road of a dilettantish farmer tilling a lost paradise." For all its satisfactions this kind of life did not bring him serenity. "I was a disagreeable presence even to those in my family," he recalls. His belief that headlong industrialization of agriculture in Japan was not only wasteful and unnecessary, but also highly destructive to the earth — perhaps irrevocably so — caused him in the mid-1970s to formulate his philosophy to reach a public audience. In Shizen Noho Wara Ippon no Kakumei  — translated into English in 1978 as The One-Straw Revolution — he distilled his experience of the past thirty years. He not only introduced his principles of natural farming but put forward his understanding of how natural farming related to larger issues. The book bore a powerful message: mankind, seduced by its intellect into thinking it could conquer nature, was launched upon a dangerous path. In the short run, chemical-driven scientific agriculture undeniably produced abundance. But by intervening in nature with machines and chemicals; scientific agriculture would backfire in the long run. Eventually it would deplete the earth's natural fertility, denude its forests, and poison its streams, rivers, seas, and ground with the toxic residues of pesticides, herbicides, and fertilizers. At the same time, weak, chemical-dependent hybrid plants would take the place of the nutritious nature-hardened fruits, vegetables, and grains of the past. The problem was so comprehensive, he avowed, that no amount of tinkering could solve it. (Short-term science-led advances — "safer" pesticides, for exampl — addressed symptoms of the disease, but not the disease itself.) The only real solution was a wholly different approach to food production which restored man's subordinate relationship to nature. This, of course, was the fundamental idea behind Fukuokas "do nothing" farming. Fukuoka also pointed out that many people had a stake in the scientific approach. These included the manufacturers of agricultural chemicals and equipment and affiliated bankers; politicians who spoke for agribusiness; bureaucrats in the Ministry of Agriculture; and agricultural scientists, virtually all of whom did state-sponsored research in public institutions. Consumers themselves were to blame. By insisting upon blemish-free, cosmetically enhanced produce, and upon fruits and vegetables out of season, they virtually compelled farmers to adopt the latest chemicals and processing techniques. Ironically, he averred, in doing so consumers were passing up the tasteful, nutritious foods of nature's garden — which might, it is true, have a rougher appearance — in favor of the nutritionatrophied products of the assembly line. All of this convinced Fukuoka that modern man was suffering from a pervasive spiritual decay, a barrenness of the soul caused by his lost intimacy with God and nature. The One-Straw Revolution, in short, was Fukuoka’s plea for man to reexamine his relationship with nature in its entirety. In his most utopian vision all people would be farmers. If each family in Japan were allotted 1.25 acres of arable land and practiced natural farming, not only could each farmer support his family, he wrote, but each "would also have plenty of time for leisure and social activities within the village community. I think," he added, "this is the most direct path toward making this country a happy, pleasant land." Although The One-Straw Revolution had little impact on agriculture in Japan, it did establish Fukuoka’s popular identity as a guru of natural farming. More frequently than before, he was called upon to speak on radio and television, and he now did so without inhibition. His provocative analysis of the degradation of modern agriculture, along with his proffered solutions, found a worldwide audience when his book was published in English in 1978. Eventually it was translated into seven other languages. Spurred by a new sense of urgency "to preserve the light of natural farming," Fukuoka began devoting more of his time to advocacy. He wrote more, spelling out in a series of articles and books his techniques for natural farming and his philosophy of nothingness, or mu. He also began to travel abroad. In July and August 1979, he visited the United States. Glimpsing California for the first time from the airplane, Fukuoka was shocked to see nearly treeless hills covered with yellow grasses. Although California's barrenness was caused in large measure by its climate — which lacks Japan's dependable rains and snows — this striking image from the plane was Fukuoka’s introduction to what he later called America's ecological disaster. As he saw it, the United States was a vast continent suffering the "relentless injuries of heavy machinery, chemical fertilizers, and pesticides." The huge monocrops of the American heartland, he said, were "fields of death" where crops fattened on petroleum derivatives as the soil was drained of its fertility. Most of these fields, he learned, yielded food grains for cattle and hogs to supply meat for what he considered the grossly indulgent and wasteful American diet. Fukuoka declared the whole process primitive in its disregard for nature. In meetings with ecologically concerned Americans, Fukuoka found many eager to hearken to his message. Already, at 250 Zen centers, American disciples of Japanese Buddhism grew chemical-free foods. The Rodale Press — American publishers of The One-Straw Revolution — was spreading the message of composting and organic farming (characteristically, Fukuoka tried to dissuade it from promoting composting), and a few Americans were experimenting with Asian-style low-meat or vegetarian diets. These hopeful signs cheered him. But the momentum of scientific farming in the United States seemed overwhelming. After a second visit a few years later, he concluded gloomily that "not even one chance in a thousand exists that America will opt for a method of farming that returns to nature." Believing that most deserts were man-made, Fukuoka dreamed of "re-greening" them through massive seeding. He was confident that in time natural farming could make them rich sources of food. To try out his idea he flew to Somalia in East Africa in 1985, bearing several hundred kilograms of grain and vegetable seeds and two hundred fruit tree seedlings. (The seeds and seedlings were donated, as was Fukuoka’s airfare.) While there, he hoped to run tests on reseeding arid lands by airplane. When this plan was thwarted, he visited a remote Ethiopian refugee camp where some Japanese volunteers were already providing assistance. Here the land was thoroughly desertized despite available sources of water. Although earlier projects had failed, he taught the refugees to sow the vegetable seeds he provided. Soon small garden patches sprouted around the village and near the riverbanks. In India, Fukuoka’s ideas preceded him. 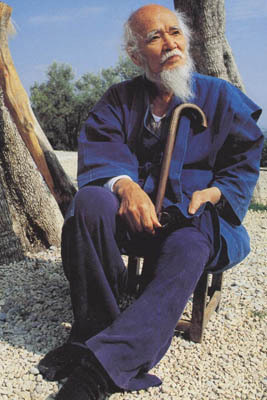 During his three-month visit there in 1987-88, he was received as the apostle of natural farming. The One-Straw Revolution had been widely distributed and read in English, and by the time of his visit the first of three vernacular editions (Malayalam, Marathi, Bengali) was also in print. With 52 percent of its people still dependent on agriculture and fishing for a livelihood, India recognized the advantages of Fukuoka’s low-cost, natural farming. Some groups were already experimenting with his techniques. Spurning visits to Buddhist monuments and other tourist attractions for visits with farmers, Fukuoka made a deep impression. At seven state agricultural universities and thirty other sites, he explained his methods and philosophy, which he linked with the teachings of Gandhi. He praised Indians for knowing the worth of philosophy and for not yet having made a science a dogma; on the other hand, he boldly criticized the Hindu reverence for cows. At Bhisva Bharati, the university founded by Rabindranath Tagore at Santiniketan, he received the Desikottam Award from Indian Prime Minister Rajiv Gandhi. Translated, the citation read: "You are a shining star in the Universe. . . ."
As word of his work and ideas spread around the world, Fukuoka inevitably attracted visitors to Iyo. Besides scientists, journalists, and farmers from many countries came young people. Arriving with only their backpacks, many of them took up residence, living in rustic huts in the orchards and joining Fukuoka in the work life of the farm. In recent years, however, Fukuoka has discouraged visitors from staying and, when in Japan, has retreated into a more solitary life of study and reflection. He lives with his wife in the ancestral home in Iyo built by his grandfather, but for study and writing he prefers the simpler environment of one of his huts in the hills. At seventy-five he carries on spryly, still farming ten acres of orchard as well as his one-acre grain field. Fukuoka has been successful commercially. His six varieties of naturally grown oranges find a good market among Japan's health-conscious consumers. These days he ships some 6,000 crates of oranges (thirty-three pounds each) to Tokyo each year. Although Fukuoka has continually refined his farming techniques over the years, he remains fundamentally inspired by his youthful insight into the futility of man's endeavor. Nature is the true perfectionist, he says. It best provides for man's survival. But man's intellect has distorted his wisdom. Modern science, along with industry and government, is leading man further and further away from nature. Fukuoka believes that Japan is today "so steeped in science that a method of farming which discards science altogether will not be digested." This is why countries like India, which are not fully industrialized and which have large rural populations, offer greater hope for natural farming. Viewing the rest of the world from the serene, prolific bounty of his farm, sage-like Fukuoka wavers between despair and hope. Perhaps the degradation of the earth is beyond repair; he often thinks so. Even if it is not, he recognizes, "the changeover to natural farming involves a sweeping Copernican transformation. It is not something that can be accomplished overnight."